As discussed on the weekend, Chinese data seriously undershot expectations, taking industrial production growth to the slowest pace since the GFC. I mentioned that the market reaction would be interesting since such poor data would push the government further towards more aggressive stimulus measures (at least in the market’s eyes). The other point I highlighted in the weekend post was the clear signs of stabilisation in the iron ore and steel markets last week. 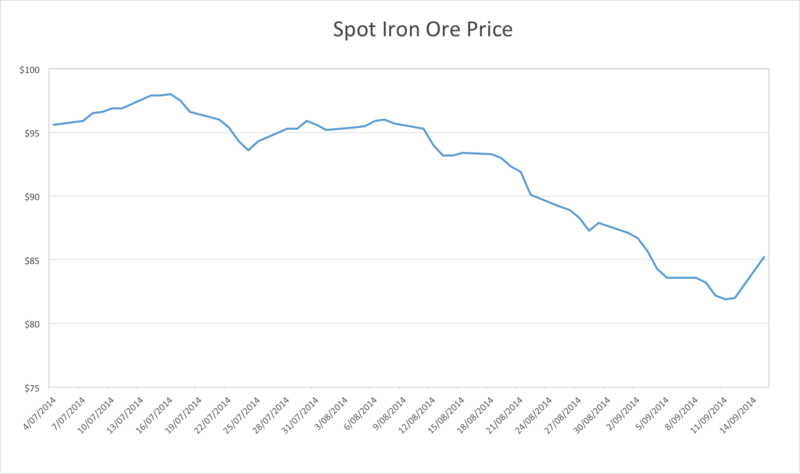 With iron ore futures in contango, low steel mill inventories, and terrible data, we had the perfect conditions for a rebound in iron ore, and indeed we got it: spot soared 3.9% to $85.20. So, the rebound is upon us, with iron ore and steel futures jumping again this morning in China. Mills have been running lean inventories, and many buyers have been sidelined over the past few weeks in anticipation of lower prices. We’ll likely see a healthy squeeze from here, but I will be most surprised if spot makes it into triple figures, given the chronic oversupply situation emerging in iron ore, the ongoing flush out of property excesses, and the inexorable down trend in fixed asset investment (FAI) growth generally. Growth in emerging market economies has slowed down, and the Chinese economy faces greaterdownward pressure. Facing this challenging environment, we have continued to follow the general principle of making progress while maintaining stability. We have stayed thecourse and pursued a proactive approach. Instead of adopting strong economic stimulusor easing monetary policy, we have vigorously promoted reform and economic readjustment, and made efforts to improve people’s lives. Despite growing downward pressure on the economy, more jobs were created, thanks to new steps of reform taken. The message is unmistakable: As long as employment growth is holding up, China is not going to undertake large-scale stimulus of the sort that sends demand for steel and iron ore soaring. As China shifts to a more services-oriented economic model, with a higher share going to consumption, it is quite possible for it to sustain adequate urban jobs growth, without pumping up FAI, aided as always by gushing credit. (I’ve discussed this process in more detail in a previous post). We saw a limited set of supportive macroeconomic policy measures from the second quarter, lasting until about a month ago. This in turn supported demand for raw material imports, but as soon as the policy support faded, iron ore and steel tanked, exacerbated by seasonal factors. Without massive monetary support for property, iron ore is not going to go much above it’s last high of $98 on this bounce. And if it does, it will not last long. In that scenario, which is my base case, the iron ore miners will begin toppling in earnest from late Q1 2015 onwards. Arrium’s recent equity raising was but a taste of the pain to come. The bounce in steel is looking decidedly lacklustre, with rebar pretty much falling across the curve today. This has taken the steam out of iron ore futures, with the January contract managing a mere .3% gain. This entry was posted in Uncategorized and tagged iron ore on September 16, 2014 by MJV.